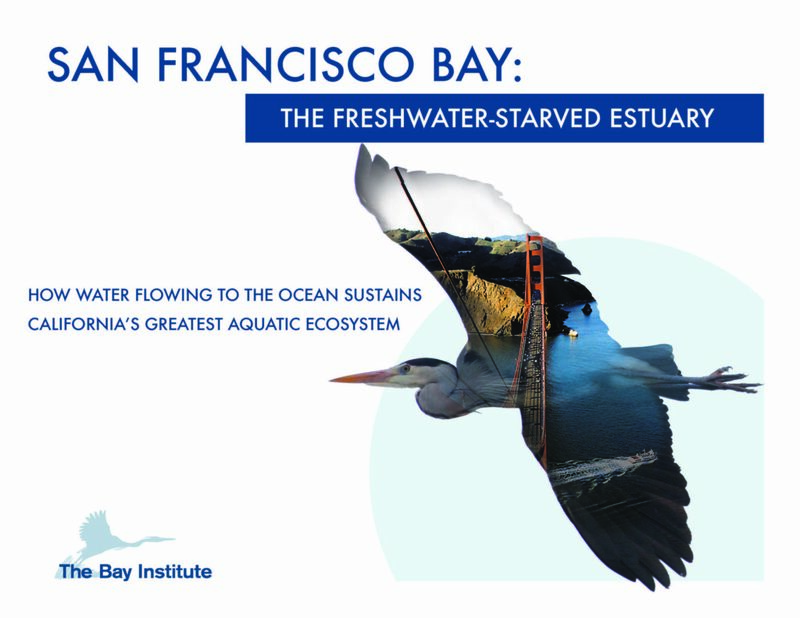 The Bay Institute’s major new study, San Francisco Bay: The Freshwater – Starved Estuary, documents how the ecological health of San Francisco Bay and the nearby ocean is at high risk because large-scale water diversion in the Bay’s watershed severely limits the amount of fresh water that reaches the Bay and alters the timing of that flow. Inflow to the Bay from its Central Valley watershed now averages less than half of what it would be without diversions; in some years just one-third of the runoff makes it to the Bay. The result is a nearly permanent drought for the Bay’s fish, wildlife, and their habitats. This radical alteration creates severe consequences for the Bay and marine ecosystems – and Bay Area residents pay the price. Makes it easier for undesirable non-native species to successfully invade the Bay Estuary. The San Francisco Bay Estuary is created by the mixing of fresh water from the Central Valley’s rivers with salt water from the Pacific Ocean. Dramatically reducing the inflow of fresh water generates cascading effects in the Bay’s watershed, the Bay itself, and coastal ocean waters. Bay Area beaches and tidal wetlands are deprived of sediment that was once transported by high river flows. The study reports that local businesses are likely to suffer from the Bay’s continued decline, including those related to commercial fishing and tourism. As our Bay, beaches, wetlands, and fish and wildlife populations deteriorate, the quality of life for many Bay Area residents will also be severely – and perhaps permanently – damaged. The study was prepared for the San Francisco Estuary Partnership, a coalition of resource agencies, non-profits, citizens, and scientists working to protect, restore, and enhance water quality and fish and wildlife habitat in and around the San Francisco Bay Delta Estuary, which also provided the majority of funding for the project. 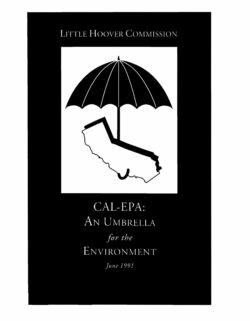 Cal-EPA was created to consolidate environmental programs and concentrate on vigorous enforcement of environmental regulations. The report discusses risk assessment activities, uniform permit processes, public involvement, and the advantages and consequences of bringing all environmental entities into Cal-EPA. In addition, the Commission addresses the short- and long-term costs and savings. The Cal-EPA report has seven findings and seven recommendations. 4. The Bay Delta Conservation Plan (BDCP) is evaluating Delta issues primarily for the goal of obtaining permits for water supply operations through a comprehensive conservation plan for the Delta designed to protect and restore at-risk species. 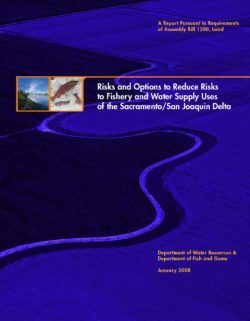 Since each process has only prepared initial findings at this point in time, this document reports on progress made to define the risks and options to reduce risks for the Delta as requested by the Legislature. Current plans call for the restoration of tens of thousands of acres of mainly intertidal habitat in the Sacramento-San Joaquin Delta and Suisun Marsh. Restoration on this scale presents both formidable challenges and tremendous opportunities. 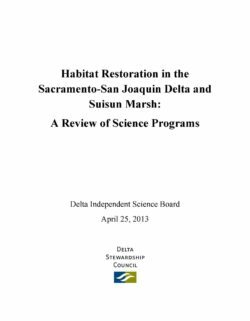 As part of its legislatively mandated oversight of Delta science programs, the Delta Independent Science Board reviewed these habitat restoration efforts. We held discussions with individuals from state and federal agencies, NGOs, consulting firms, and universities. We were impressed by their dedication, enthusiasm, and knowledge, as well as by the scientific and institutional challenges they face. Our findings and observations about the restoration efforts are grouped under a series of criteria for a successful restoration program. In such a program: the goals are clearly articulated; the design incorporates spatial and temporal context, adaptive management and flexibility, and monitoring; modeling is used in design and evaluation; planning and implementation are coordinated among projects; the necessary scientific expertise is available; and stakeholders are involved early and often. Our findings and recommendations agree with those reached independently by National Research Council (NRC) panels. For convenience, as in the Delta Plan, we use "the Delta" to encompass both the statutory Delta and Suisun Marsh. The San Francisco Bay and Sacramento-San Joaquin Delta form one of the largest estuaries in the United States. The “Bay-Delta” system provides water to more than 25 million California residents and vast farmlands, as well as key habitat for birds, fish, and other wildlife. 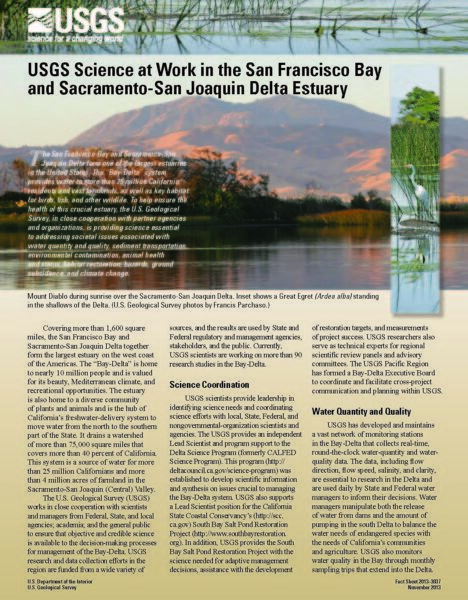 To help ensure the health of this crucial estuary, the U.S. Geological Survey, in close cooperation with partner agencies and organizations, is providing science essential to addressing societal issues associated with water quantity and quality, sediment transportation, environmental contamination, animal health and status, habitat restoration, hazards, ground subsidence, and climate change.